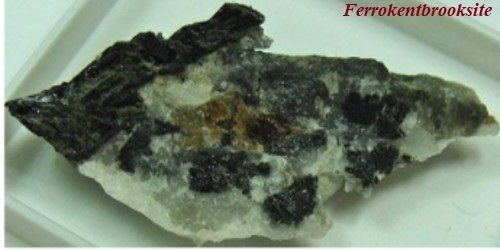 Ferrokentbrooksite is a moderately rare mineral of the eudialyte group, with formula Na15Ca6(Fe,Mn)3Zr3NbSi(Si3O9)2(Si9O27)2O(O,OH,H2O)3(Cl,F,OH)2. It is a trigonal-ditrigonal pyramidal mineral containing aluminum, calcium, chlorine, fluorine, hafnium, hydrogen, iron, manganese, niobium, oxygen, potassium, silicon, sodium, strontium, tantalum, titanium, yttrium, and zirconium, as well as lanthanum, cerium, praeseodymium, neodymium, and samarium. It occurs as reddish brown to red, pseudo-octahedral crystals to 1 cm in diameter. The original formula was extended form to show the presence of cyclic silicate groups and presence of silicon at the M4 site, according to the nomenclature of eudialyte group. It is transparent with a vitreous luster and a white streak. It is brittle, with a hardness of 5–6 (Mohs scale). It has no cleavage, no parting, and an uneven to conchoidal fracture. As suggested by its name, it is the (ferrous) iron analogue of kentbrooksite. When compared to the latter, it is also chlorine-dominant instead of being fluorine-dominant. 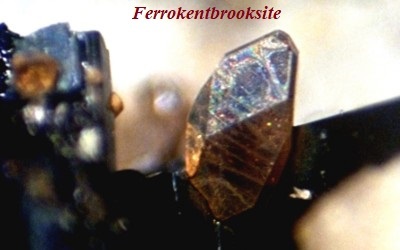 Ferrokentbrooksite was discovered in Mont Saint-Hilaire, Quebec, Canada – a site wealth in rare alkaline minerals. At the site, ferrokentbrooksite coexists with aegirine, albite, ancylite-(Ce), calcite, catapleiite, fluorite, fluorapatite, gonnardite, microcline, natrolite, nepheline, rhodochrosite, and serandite. Associated minerals include microcline, nepheline (partially altered to natrolite), fluorite, fluorapatite, natrolite, gonnardite, rhodochrosite, aegirine, albite, calcite, sérandite, ancylite-(Ce), and catapleiite.